The Great Seal of the State of Illinois is the official emblem of the state, and signifies the official nature of a document produced by the state of Illinois. The flag of the state of Illinois consists of the seal of Illinois on a white background, with the word "Illinois" underneath the seal. The present seal was adopted in 1869, the flag bearing the central elements of the seal was adopted in 1915, and the word Illinois was added to the flag in 1970. The current flag depicts the Great Seal of Illinois, which was originally designed in 1819 and emulated the Great Seal of the United States. In the eagle's beak there is a banner with the state motto, "State Sovereignty, National Union." The dates on the seal, 1818 and 1868, represent the year Illinois became a state and the year in which the Great Seal was redesigned by Sharon Tyndale. Although "State Sovereignty" comes first in the motto, "State" is at the bottom and "Sovereignty" is upside-down. 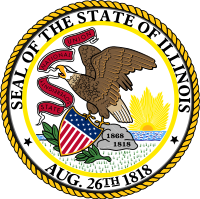 The first Great Seal of the State of Illinois was adopted in 1819 by the first Illinois General Assembly. The first law authorizing the Great Seal required the Secretary of State of Illinois to procure and keep the seal. The first seal engraved was essentially a duplicate of the Great Seal of the United States. It was used until 1839, when it was recut. The seal designed in 1839 became the Second Great Seal. Illinois Secretary of State Sharon Tyndale spearheaded the drive to create a third state seal for Illinois. In 1867, he asked State Senator Allen C. Fuller to introduce legislation requiring a new seal, and suggested to Fuller that the words of the state motto be reversed, from "State Sovereignty, National Union", to "National Union, State Sovereignty". However, the bill passed by the legislature on March 7, 1867, kept the original wording. Despite declining his suggestion, the legislature nonetheless entrusted Tyndale with designing the new seal. And Tyndale managed to (literally) twist the legislature's intent; he kept the words in the correct order on the banner, but the banner twists, so the word "Sovereignty" is upside down, arguably making it less readable. Tyndale's seal features a bald eagle pitched on a rock carrying a shield in its talons and a banner with the state motto in its beak. Thirteen stars and thirteen stripes on the shield represent the original thirteen states of the Union. The date August 26, 1818, when Illinois's first constitution was adopted in Kaskaskia, appears along the bottom arc of the circle, and 1818, the year of statehood, displays on the seal below 1868, the year the current seal was adopted. This basic design has survived through several minor modifications since it was first conceived. The Illinois Secretary of State is still the keeper of the Great Seal of the State of Illinois. Ella Park Lawrence holds the original Illinois state flag, ca. 1915. During her time as state regent of the Daughters of the American Revolution in 1912, Ella Park Lawrence began a campaign to have Illinois adopt a state flag. She was unsuccessful during her time as state regent, but continued to lobby members of the Illinois General Assembly to adopt a state flag as a member of the Rockford chapter of the Daughters of the American Revolution. On April 1, 1914, Lawrence sent a letter to every Illinois chapter of the Daughters of the American Revolution announcing a contest to design an Illinois state flag, with the winner receiving a prize of $25. Thirty-five designs were submitted in response to this contest. The contest was judged by a panel chaired by Lewis Stevenson, Illinois Secretary of State. They selected the design of Lucy Derwent. The flag became the official state banner on July 6, 1915, following its passage in the Illinois State House and Senate. Governor Edward F. Dunne did not sign the bill, but he did not veto it. In the 1960s, Chief Petty Officer Bruce McDaniel petitioned to have the name of the state added to the flag. He noted that many of the people he served with during the Vietnam War did not recognize the banner. Governor Richard B. Ogilvie signed the addition to the flag into law on September 17, 1969, and the new flag was designed by Mrs. Sanford Hutchinson and became the official flag on July 1, 1970. For Illinois's first 100 years of statehood in 1918, Wallace Rice, who designed Chicago's flag, designed a centennial flag for the state. It had three horizontal bands of equal width alternating white, blue, white. It was charged with 21 stars along the edge of the hoist. There were 10 blue stars in the upper white band and 10 in the lower white band, representing the 10 northern and 10 southern states at the time of Illinois' statehood in 1818. The center blue band had one large, white star for the state of Illinois itself. ^ "Seal of the State of Illinois". CyberDrive Illinois. CyberDrive Illinois. February 9, 1996. Archived from the original on February 10, 2012. Retrieved February 10, 2012. ^ Bartlett, Mabel Lane. "Illinois : know your state : [a text workbook]". Illinois University Press. Archived from the original on 2016-09-27 – via Internet Archive. ^ a b c Office of the Illinois Secretary of State (2007-03-31). "Illinois Handbook of Government: 2007-2008" (PDF). p. 134. Secretary of State of Illinois. Archived from the original (PDF) on 2007-12-03. Retrieved 2007-09-14. ^ a b c d e f "Park Lawrence, Mother of the Illinois Flag". www.thezephyr.com. Archived from the original on 2012-03-10. ^ Office of the Illinois Secretary of State (2007-03-31). "Illinois Handbook of Government: 2007-2008" (PDF). p. 135. Secretary of State of Illinois. Archived from the original (PDF) on 2007-12-03. Retrieved 2007-09-14. ^ "Illinois Anniversary Flags (U.S.)". www.crwflags.com. Archived from the original on 2012-10-19. This page was last edited on 7 February 2019, at 01:37 (UTC).